More than 60 large wildfires burning across U.S.
DENVER -- An erratic wildfire charging through extremely dry land in the heart of Colorado ski country destroyed three homes and forced people to flee, authorities said Thursday. Elsewhere in Colorado, a rare high-elevation tornado touched down at the site of another wildfire Thursday but apparently caused little damage and had no effect on the fire. In California, an official said Friday that a person died in a fast-moving blaze near the Oregon border. In Colorado, residents of multimillion-dollar properties, modest condos and mobile homes were ordered to evacuate early Thursday because of the Lake Christine Fire, an unpredictable blaze reported the night before near the town of Basalt. More than 500 homes were affected. A tornado was reported Thursday south of Fairplay, a central Colorado town about 10,000 feet above sea level. It appeared to touch down at or near the edge of the Weston Pass Fire, which has burned about 17 square miles, or more than 10,000 acres, National Weather Service meteorologist Russell Danielson said. Another Colorado wildfire, the Spring Creek Fire, about 205 miles southwest of Denver destroyed more than 130 homes and forced more than 2,000 people in three counties to evacuate. It grew to about 160 square miles, or over 100,000 acres, Thursday. By Thursday night, the fire northwest of Sacramento had burned nine buildings and 137.5 square miles. However, authorities didn't immediately indicate whether any homes had been destroyed in the rural area, although about 110 structures remained threatened, according to state fire officials. Some of the 2,500 people who were under mandatory evacuation orders were allowed to return home. Cal Fire spokeswoman Suzi Brady said a person died in a separate blaze near the Oregon border but that she couldn't release any other details because next of kin have not been notified. Authorities say the Klamathon Fire jumped across Interstate 5 south of the border in California and closed the southbound lanes in that area. The fire started Thursday afternoon. California Gov. Jerry Brown declared a state of emergency for Siskyou County, citing "extreme peril" to people and property. There were some evacuations in the tiny town of Hornbrook. Brady said the blaze is threatening 300 homes near the town of 250 people about 14 miles south of the Oregon border. The fire has burned more than 12 square miles. It was 5 percent contained. In northern New Mexico, a wildfire closed a ranch where novelist D.H. Lawrence once sought spiritual renewal. 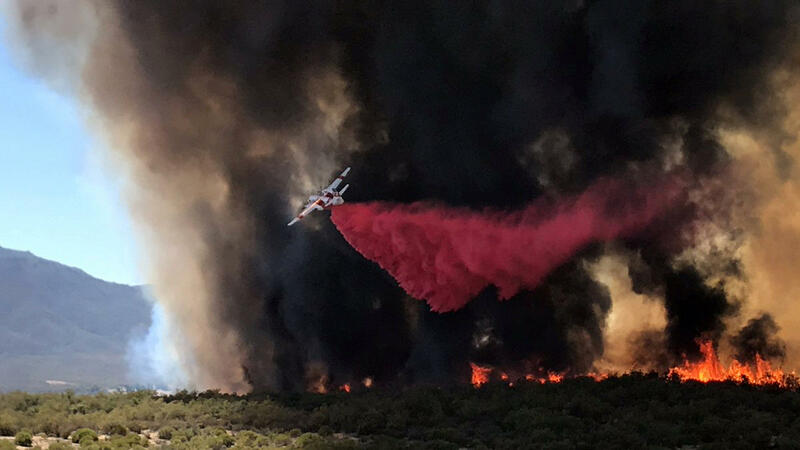 Officials said a fire in drought-stricken Carson National Forest has scorched nearly 4 square miles since June 24 and is only partially contained. In Utah, scorching summer temperatures and winds quickly pushed flames through bone-dry vegetation near a popular fishing lake about two hours southeast of Salt Lake City. The 66-square-mile fire near Strawberry Reservoir has burned about 90 structures.